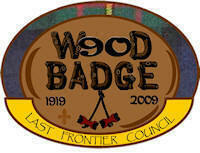 Wood Badge for the 21st Century is the advanced training program for adult leaders in the Boy Scouts of America. Go to our fellow site LFCWoodBadge.org to learn more about Scouting’s premiere training. An annual reunion banquet occurs each January, proceeds help fund scholarships for this training. This year introduces a new collectable patch celebrating 90 years of Wood Badge. Tickets are $15 prepurchased by January 14 or $20 at the door.